The majestic fragrance of this Incense Stick will surely remind you of the long forgotten culture of pure and aromatic spices. 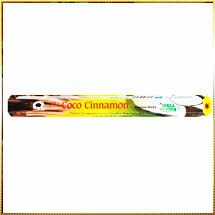 Our Coco Cinnamon Incense Sticks with its refined fragrance are loved by one and all. The innovative combination of the fragrances creates a relaxed environment that refreshes the senses. The fragrance arouses the meditative mind and thus helps you to concentrate on God during prayers. Our Coco Cinnamon Incense Stick is an outcome of a perfect blend of aromatic flowers, rare herbs, and biotic combustible materials that releases less smoke. Thus, customers can enjoy a fragrance without concerning on health factors.